Composite class narrow gauge sitting cars. The bodies were built by the Commonwealth Railways on the underframes of earlier cars. Note the history of some cars is a litle confusing as the North Australia Railway branch of the Commonwealth Railways was not very good at keeping accurate records of its rollingstock. 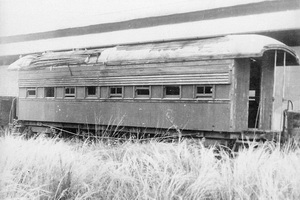 It was reported in 1947 that NABP 6 and 7 were new bodies built on underframes of cars 1 and 4. Cars 3 and 4 were originally numbers 2 and 3. Both cars are reported as out of service 12.7.1946. 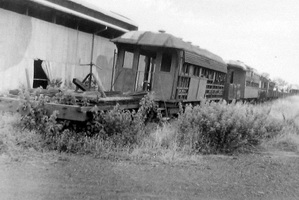 A new body, built at Port Augusta workshops, was fitted in 1942 to the underframe of "NAP 1" at the Katherine workshops. Capacity 14 first and 20 second class passengers. 1942 Entered service "NABP 6"
- Out of service by 12.7.1946. - Sold to Fujita Salvage Co.
A new body, built at Port Augusta workshops, was fitted in 1942 to the underframe of "NABP 2" at the Katherine workshops. Capacity 14 first and 20 second class passengers. 1942 Entered service "NABP 7"
This page was last updated on Wednesday 3 Jan 2018 at 9:22pm.